It's October in San Diego, which means that the evenings are slowly growing shorter while the feeling of summer still lingers in the air, holding on as the Santa Ana winds rustle the palm trees. These October days, my mind meditates on the memory of a little girl, the music we played together, and the lessons she taught me. I had the privilege of working with Isabel as her music therapist for over two years through my work with Coast Music Therapy. Izzy had Spinal Muscular Atrophy (SMA) Type 1, which meant that when I first met her at the age of four years old, she was unable to move her body with the exception of small movement in her fingers and slight movements of the mouth and eyes. SMA Type 1 generally manifests itself in the first few weeks or months of life and is a degenerative disease characterized by loss of motor function while cognition does not seem to be affected. At her young age, it became evident to Izzy's family that their little girl loved music. So, along with a home education team, they made a request for music therapy services to support her in a wide range of therapeutic goals. From the beginning of our time together, Isabel moved my heart deeply. Without spoken language, she communicated through her eyes, the slight lifting of the corner of her mouth to form a little smile, and with movements of her tiny fingers. She would choose a particular song or instrument through eye gaze or later on in our sessions when, with access to wonderfully sophisticated computer, she was able to move her little finger to activate a laser switch that would help her navigate through pages of options in order to communicate what was going on inside her world. Once a week, for over two years, I sat in awe of Isabel and she was my teacher. There were many things that changed in me over the time that we worked together. A few years ago, as a Rotary Peace Fellow, I did an M.A. in Peace Studies. The whole experience was of incredible value and taught me a great deal about the challenges faced in building a more peaceful world. Being with Izzy and taking time to listen to her offered me something that no classroom environment could have given. In order to become a truly peaceful society, we must provide spaces for the voices of the weakest members of our society to be heard. This is the foundation on which a truly vibrant peace is built. Through the act of tuning in to the most subtle of Izzy's eye movements, the minute movement of a finger, playing and creating songs in the moment that were completely as a response to this tiny person, I learned the value of presence and noticing all things, even if they might be small. I also realized the time, resources and creativity it takes to allow spaces for all people to be heard and equally valued. Isabel taught me the importance of adapting my work again and again to best serve another person. As we therapists, carers and health practitioners worked with Izzy, our attempts to track progress all focused on changes in her. While this was of great importance, it only tells part of the story. In that equation, she was always a passive recipient. The reality, if we choose to become aware of it, is radically different. Through every interaction and challenge we encountered alongside Izzy, we were offered an implicit opportunity to reflect on how she had helped us to develop and grow on both a personal and professional level. Isabel taught me to understand more deeply the power of music to facilitate human connection. Music brought with it the gift of creating something of beauty in response to Izzy's profound life. It was more than simply keeping her clean and fed. It was a radical statement that said, "your life and perspective is of such great value that I will take time with you to create something beautiful together." As my eyes look up toward the sky on this October day, I remember a day much like today just over a year ago. I was walking to my car, and I got a call telling me that Isabel had died. She was six years old. I got in my car and wept, because I loved her. Izzy had touched my life so deeply that I felt I wanted to give her some gift, pay her some small tribute. After she passed away, I contacted her family and offered to play and sing at her memorial. When I asked her mother what she wanted me to play she said, "What would Izzy ask you to play?" I knew right away, the ukulele and "What a Wonderful World." And so we gathered to remember Izzy and connected with her through a song she loved. 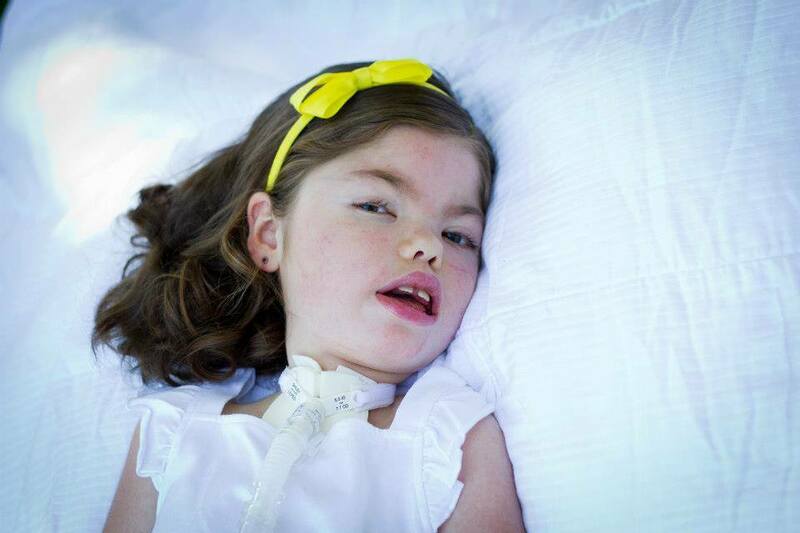 In the year since Isabel's death, I have longed to know more about Spinal Muscular Atrophy. I have been encouraged by the courageous families and professionals who are advocating for research and resources for children affected by SMA. I have been amazed at the strength of Izzy's family as they carry their grief in a way that honors Izzy by raising awareness and funds for continued research. And more than anything, I have reflected on the lessons taught me by this young girl. When I am ridden with the anxieties of our fast-paced world, when I am convinced that I must do more, produce more, write another article, Instagram another photo, I remember that Izzy never did any of those things and yet, her life was incomparably powerful and meaningful. Because of Izzy I am a better music therapist, and also perhaps a better person. Izzy is with me in every music therapy session I have. With each individual I encounter, I look at them and I ask, "what will you teach me about the world?"